Basements are prone to water issues given their location. A lot of pressure can be put on your home’s basement walls from the outside soils and can cause water to leak through to your basement. Water damage can wreak havoc on your basement and cause even more damage to the rest of your home. If you notice any signs of water damage in your basement, it’s important to get it looked at right away before it becomes worse. At Total Foundation Solutions, we have provided basement waterproofing solutions for our customers throughout Northwestern Pennsylvania and Western New York for over 30 years. Trust in our waterproofing experts to keep your basement dry and healthy. What Causes Basement Water Damage? There are many different factors that can lead to water damage in your basement. It’s important to know the signs of water damage so that you can call in an expert right away for a basement waterproofing recommendation. Most basements experience some degree of hydrostatic pressure that can cause water damage. This pressure comes from groundwater that pushes against your basement walls as soils in the ground contract and expand. The soils become saturated with groundwater and pressure builds up. Since the water has no place else to go, it pushes against your basement walls and can cause major water or structural damage. As the hydrostatic pressure builds up and pushes against your basement walls, the groundwater can easily seep through any wall or floor cracks in your basement. Water can manage to make its way through even the tiniest of cracks and lead to bigger problems over time. If you notice even small cracks in your basement walls or floors, talk to an expert about basement waterproofing solutions before the problem becomes worse. Plumbing leaks can quickly cause water damage in a basement. 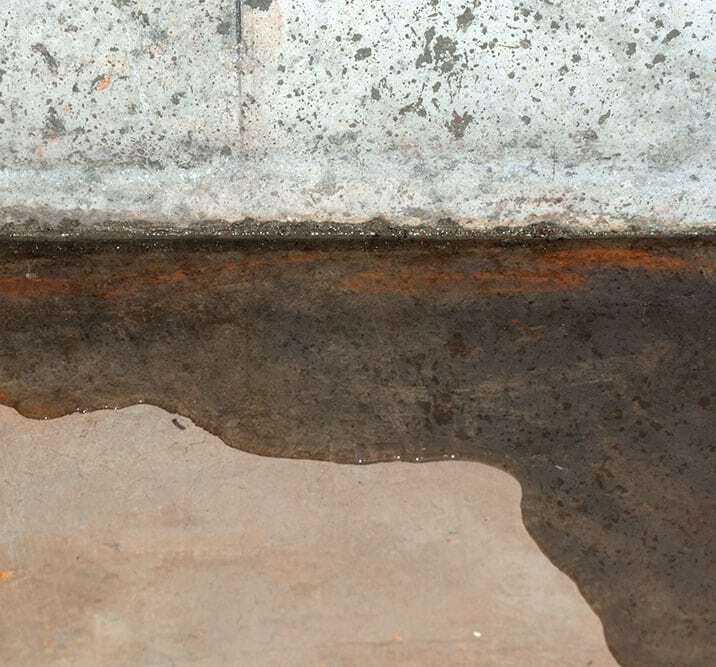 Leaks can spring from above ground or under ground pipes and cause flooding in your basement. Depending on the severity of the leak, it can either quickly cause your basement to flood or can start to show signs of damage over a longer period of time. Either way, it’s important to keep an eye out for any signs of plumbing leaks and to quickly find a suitable basement waterproofing solution. A lot of household equipment is stored in the basement such as your furnace, water heater, sump pump, and other equipment. Your water heater and your sump pump are the two main pieces of equipment that can cause a flood in your basement. Water heaters can flood and quickly fill your basement with water. If you have a sump pump installed and it fails to operate properly, there is nothing to keep water damage out of your basement. Some symptoms are more subtle than others and have the potential to be very dangerous to your health. If you notice any major or subtle signs of water damage, it’s best to contact us right away for a recommendation on basement waterproofing solutions. At Total Foundation Solutions, we offer a number of different basement waterproofing solutions to keep your basement dry and healthy. Whether you need a minor fix or a complete waterproofing system installed, our team at Total Foundation Solutions can provide your home with the proper basement waterproofing products to protect it from water damage. Customers throughout Northwestern Pennsylvania and Western New York have benefitted from our basement waterproofing solutions for over 30 years. We have proudly protected basements and have helped homeowners avoid the dangers caused by basement water damage.